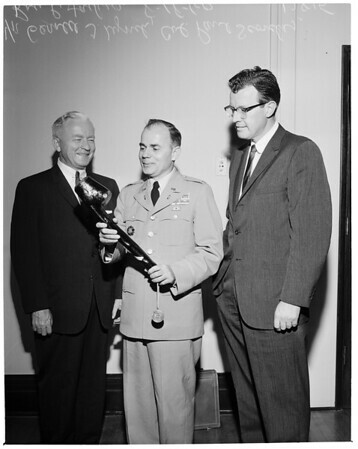 Supplementary material reads: "Shillelagh presentation -- Col. Paul Scordas, commanding officer of the Los Angeles Ordnance District, U.S. Army, receives a genuine Irish shillelagh from Gerald J. Lynch (left), vice president of Ford Motor Company's Defense products group and general manager of the Company's Aeronutronic Division, symbolizing the lethal new Army Shillelagh guided missile system under development by Aeronutronic. Looking on is Roy P. Jackson, (right), general operations manager of Aeronujtronic's Tactical Weapon Systems Operations which has responsibility for the Shillelagh program. From: The News Bureau, Aeronutronic Division, Ford Motor Company, Ford Road/Newport Beach, Calif., ORiole 5-1234, Ext. 1236."